In Which We Salute the Working Girls! The Ladies needed hay yesterday. These giant, round bales weigh around 900 pounds each, so they aren’t easy for me, a short, nearly 50-year-old woman to toss around by herself. Occasionally I manage to nudge the bales off the bed of the truck, but most often I can’t. Yesterday it just wasn’t going to happen, so I had to use both the truck and tractor. Anyway, I’ll spare you the frustrating, ridiculous and filthy details, but the point is this: too much fuel was used for something the cows could have done themselves had they known how. At just under $3.40 per gallon. As I go about my routine, I often ponder the many things we use energy to power that could actually, in reverse, create bankable energy if we ourselves supplied the power. In the modern urban/suburban lifestyle, the gym is a glaring example. We pay money for club memberships or home exercise equipment all with fancy digital displays telling us how many calories we’ve burned. Then, not only do we plug-in and consume energy, all the power we generated remains uncollected. And, we paid for the service instead of getting paid for our work. Here’s a better idea. Everyone who’s anyone in suburban neighborhoods these days has a riding lawnmower. What’s wrong with an old-fashioned hand pushed reel mower? By working up a sweat in your yard, you saved the gas from the drive to the gym, the energy you’d use to power your treadmill and the gas you’d use in your lawn tractor. Turn of the century there were lots of hand and animal powered gadgets to get things done more efficiently that didn’t require any more energy than you could supply yourself. Those inventions were the great grandparents of today’s modern appliances. Go to any antique store and you’ll find hand cranked sausage grinders, grain mills and egg beaters. I live in between two Amish communities, so I see animal power at work nearly every day. Every time I put gas in the lawn mower I am bothered by the awareness that my chubby Shetland pony, unemployed since his girls outgrew him, could be helping with that chore to both our benefits. 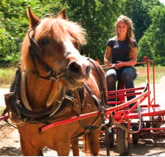 Apparently I’m not the first person to think of this: Michigan siblings Kathryn and Christian Birkey started a business called Clementine’s Lawn Mowing with their pony Clementine. The kids used their pony, a horse-drawn mower and a human pushed reel mower to mow neighborhood lawns. And were recognized with plenty of awards and entrepreneurial grants for their ingenuity. We’ve wandered so far from the farm in the last 100+ years. This sort of idea is almost completely forgotten, but I assure you it still has relevance. 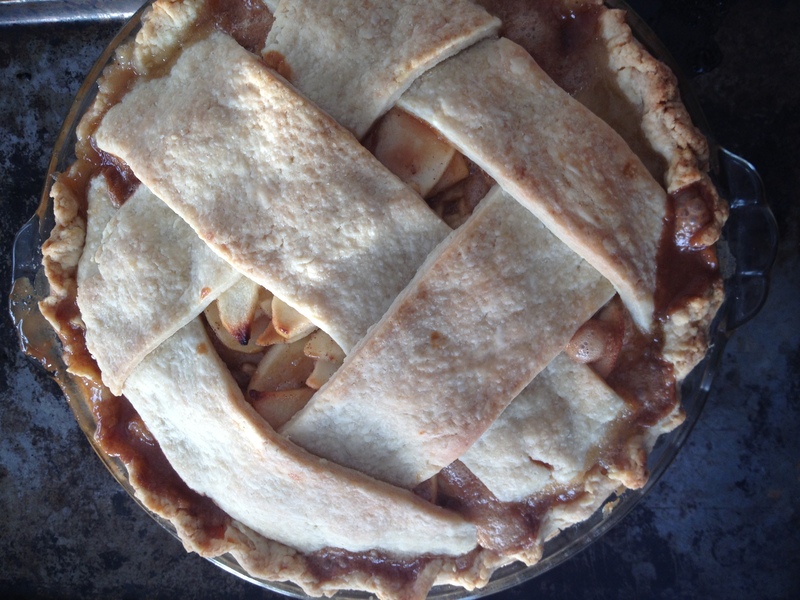 There are quietly living among us Americans who haven’t forgotten old skills. They may be Amish, or part of organizations like Tillers International and approach the problem of feeding the world from a fresh, new/old perspective. Developing countries struggle with access to reliable power. Farming in remote places just can’t be dependent upon mechanized parts and gasoline. Draft animals enable farmers to devise solutions without needing complicated equipment and hard to come by services. Instead of offering handouts, Tillers International works to prevent low technology farming, smithing and harness making skills from being lost. They then help third world farmers in a grass-roots, people to people sharing of those skills and knowledge. 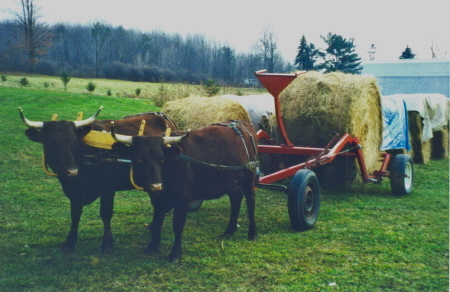 Once villagers have learned to work with draft animals, they are able to expand their ability to generate their own food supply. Even here in the US, small diversified farms can benefit from using animals as fuel prices continue to rise. The wave of new, young farmers returning to the land are exploring all sorts of renewable energy options, including draft animals. Thanks to experienced teamsters like those at Tillers International, so willing to share their wisdom, these skills are waiting to be put to practice by farmers once again. My girls come from a long line of working cows. In fact, they have relatives still working today owned by Howard and Andrew Van Ord from Russell, Pennsylvania. 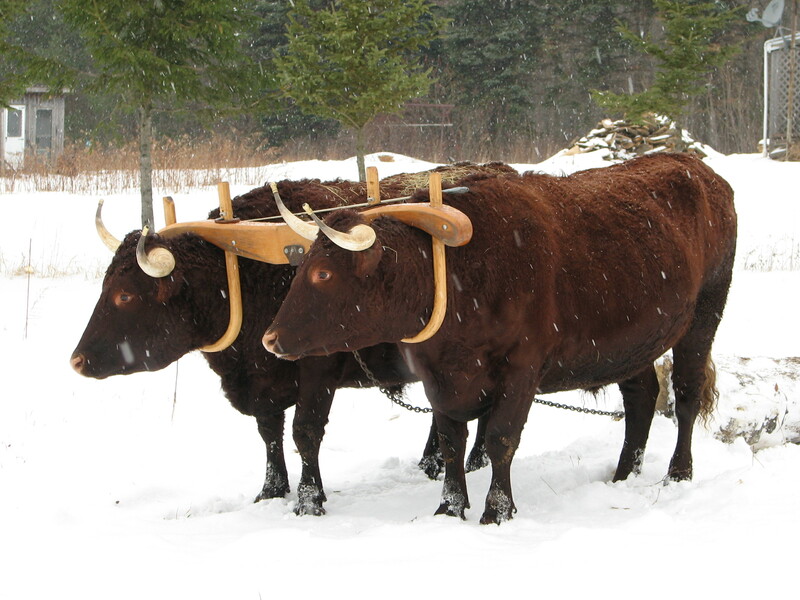 The Van Ords have been working with oxen since 1957. They are very generous with their time and knowledge, participating in drover associations and authoring numerous articles. Of all the breeds of cattle they’ve trained, Howard claims the Milking Devons to be the best. A funny fact: Milking Devons are the fastest walking breed of cow; the Ladies come by that snap in their step honestly. It isn’t nostalgia, it’s progress. < Previous In Which We Laugh: Good Golly Miss Molly! Next > In Which We Say Hello! Thanks E.Baron. Strange, but true. I’m not a survivalist, but living so near the Amish, it’s not hard to see just how frightening our lack of basic knowledge of living without electricity is.